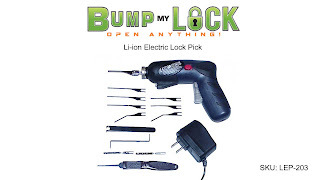 Li-ion Electric Lock Pick Gun Review. The Li-ion electric lock pick gun has become our best selling lock pick gun, and I wanted to see what made it so popular. First impressions sometimes say it all and that is the case with this lock pick gun. The case it comes in is a nice, sturdy, formed case that holds the gun and accessories in place and keeps it safe from and accidental drop. The gun itself is made from quality materials and feels very strudy in your had. This tool has the gun shape which makes it easy to handle, being a more natural feel. One of the really cool features of this lock pick gun is the direction switch. Switching the direction of the pick is as easy as hitting the switch. No more having to have a upward and a downward striking gun. There is a nice little LED light on the end of the gun so you can see where you are working, this really comes in handy and even provides more visibility in well lighted areas. This set comes with by far the most needles with the most variety I have seen on a pick gun; not only do you have the standard needles, but you have a twist needle that will give you a wider surface area. Another atachment that is nice is the divot lock needle, this will come in handy on some more secure locks in the US and Europe. The well thought-out design and packing of this set also comes with an extraction tool for any broken needles or keys. This tool has a great battery life and a lot of power. In conclusion, this is by far my favorite lock pick gun to date and has a lot of features that make using this tool a dream. I now see why this is our best selling lock pick gun. Check out the video below for a closer look.